Hilton Head Island is known for its white sandy beaches, stunning displays of nature, and family friendly atmosphere. 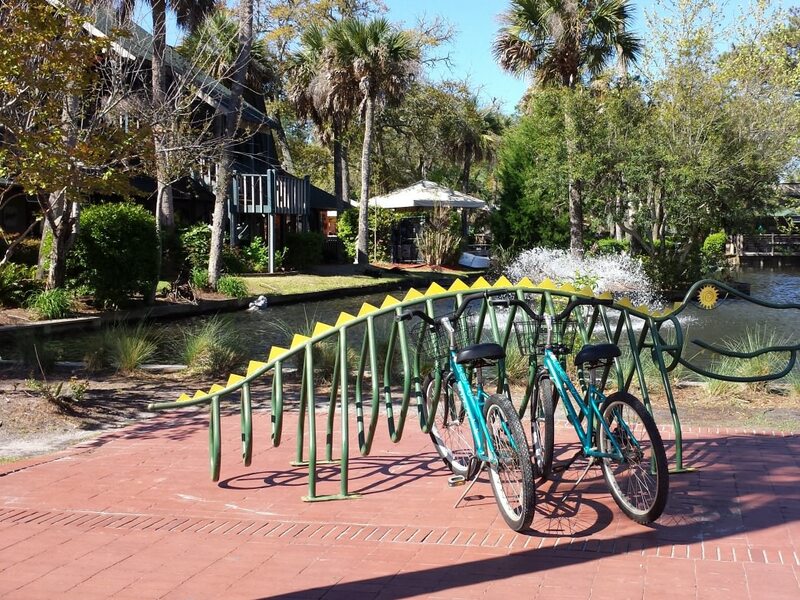 While none of these things are all that surprising, what you may not be aware of is that Hilton Head Island is also a renowned and thriving bicycle community. Being able to easily navigate Hilton Head with a bicycle has been a mission of the island town ever since development began in earnest in the 1970’s. With almost 60 miles of public bike pathways on an island that is only 12 miles long it’s clear to see that Hilton Head Island takes cycling seriously. Just this year The League of American Bicyclists awarded Hilton Head a “Gold” rating in their Bicycle Friendly Community index, making Hilton Head one of only two cities on the entire eastern seaboard to hold that honor. While any time is a great time to explore, mild fall temperatures and fewer visitors make for primo cycling. Whether you want a relaxing cruise or a heart pumping workout, we’ve got you covered. Before we get to the 60 miles of paved pathway, let’s start with a uniquely Hilton Head experience: beach biking. 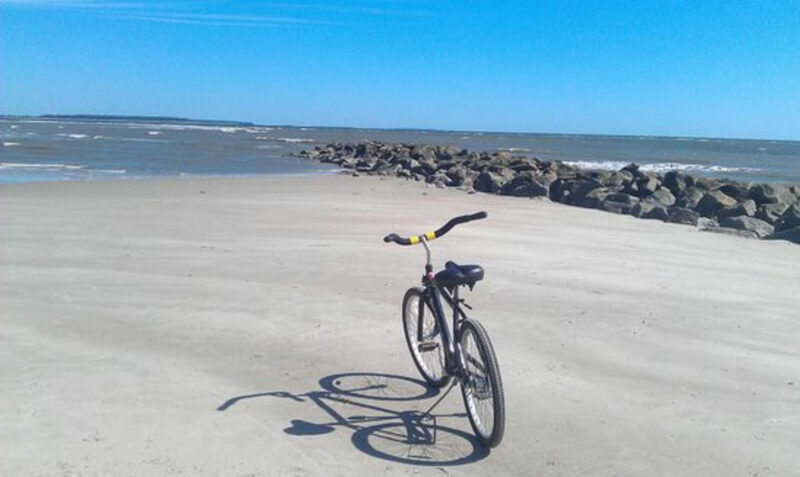 Hilton Head is home to wide, flat, and firm beaches that are perfect for cycling. There are 12 miles of continuous beach so you can reach a majority of the island from the beach alone. To start the perfect day of beach cruising head to Folly Field Beach, a centrally located portion of Hilton Head’s stretch of beaches. If you are looking for a no-nonsense, less crowded ride, the kind perfect for soaking in your surroundings, head north from Folly Field. The beaches to the north are more residential which means less people on the beach, and no attractions along the way. This is the perfect ride for people who want to take in Hilton Head’s sweeping beauty from a bike seat. Take a left when you arrive at Folly Field and you’ll have miles of relaxing cruising. If, on the other hand, you are looking to see and be seen, south is the direction you want to head. This will take you toward the more lively side of the island with opportunities to stop for lunch or grab a beverage. Once you get to Folly Field you’ll head right if you’re facing the ocean, this is south. The beginning of your ride will be relatively quiet as you pass Burkes Beach and other more residential areas on your way to the South End. One thing to be aware of is a tidal inlet called “The Folly” that you will have to cross. It is located just south of Burkes Beach, at high tide the water can move quickly and can be a little deep. It can be crossed then, but with a bike this process can be cumbersome, we recommend crossing during low tide when the water is reduced to a trickle. Just be mindful of the tides as you plan your ride and be careful if you have to cross at high tide. Once you’ve passed the Folly it is smooth sailing down to Hilton Head’s south end. As you make your way down the Beach you’ll notice resorts along the beach. Most have poolside restaurants and bars that are open to non-guests if you want to stop for a bite, just be sure to check signs and make sure you’re allowed in. A favorite spot for locals and tourists alike is the Beach House hotel near Coligny Beach. This hotel hosts a great southern restaurant called “The Porch” and a world class beach bar called the “Tiki Hut.” Both are sure to please. 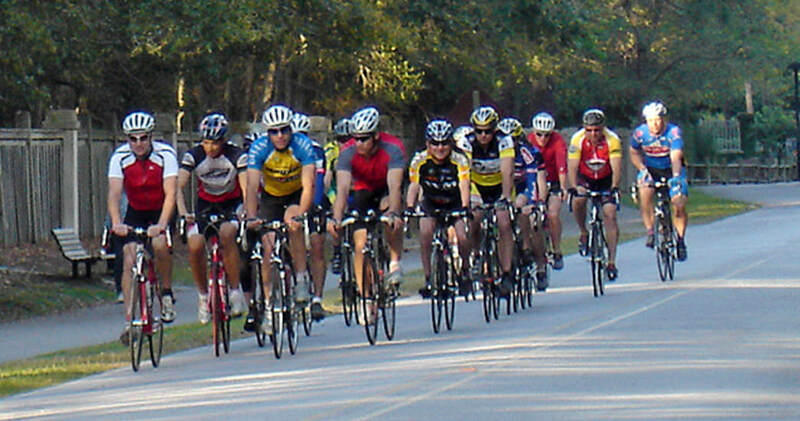 One of the island’s most renowned places to bike is Sea Pines Plantation. 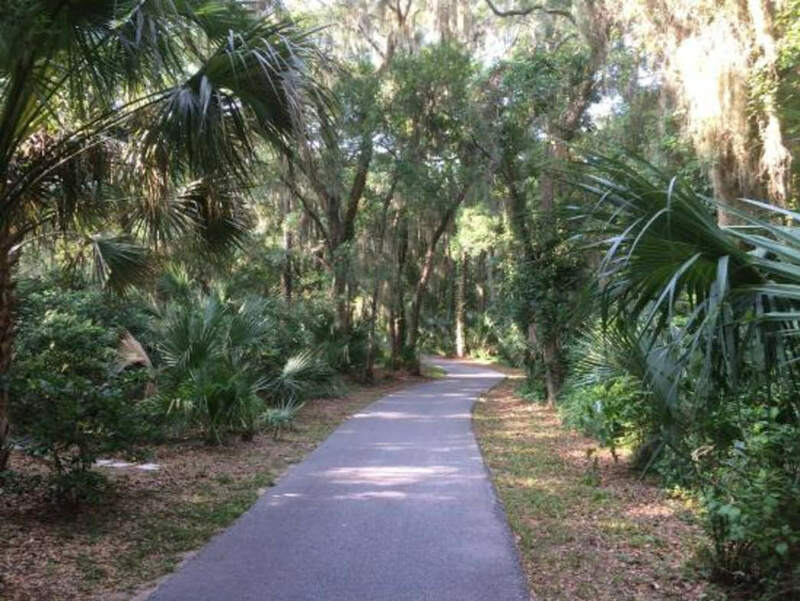 There is a fee to enter if you’re not staying in Sea Pines, but once you’re in you have access to 17 miles of some of the island’s most beautiful bike trails. There is also a good deal of shopping and restaurants within Sea Pines gates. For nature lovers, the Sea Pines Forest Preserve is a beautiful expanse of wooded land and wetlands with bike trails that weave through it. The entry fee for Sea Pines is $6 per vehicle plus an additional dollar for every bike you bring in. 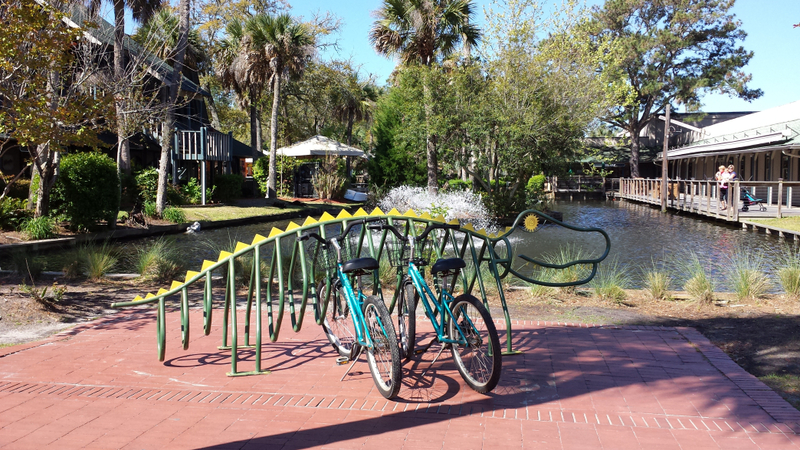 If you don’t have bikes with you, there are a number of rental options within Sea Pines' gate. Some, like South Beach Bike Rentals, even provide hourly rates. Unfortunately you cannot ride bikes into Sea Pines, so you’ll have to drive them in or rent inside. You can begin your Sea Pines journey at either Harbor Town or South Beach. Both locations are home to some of Hilton Head’s most iconic attractions: The Lighthouse and The Salty Dog Cafe, respectively. We recommend choosing where you’d like to eat when you’re done with your ride and starting there. That way, after a day of biking you can return to your car, get off your saddle, and unwind with some great food. CQ’s, a delicious upscale restaurant, and Crazy Crab, a Hilton Head seafood classic, are your best bets in Harbor Town. South Beach has Salty Dog Cafe, home to casual seafood and sandwiches; Jake’s Pizza, a small pizza parlor; and The Wreck, a more upscale seafood restaurant. You can get bike maps at the gate to Sea Pines and most bike rental companies will have them as well, use these to plan your day of biking. History buffs will enjoy the Stoney-Baynard Ruins – stucco ruins from an old plantation house on the property – as well as the Native American shell ring that can be found in the Forest Preserve. No matter where you start, the Lighthouse is not to be missed; there are incredible views from the top. The viewing deck closes shortly before sundown, so plan accordingly. If a casual ride is not your thing, and you’re looking for a ride that makes your quads scream and your heart pound, Hilton Head Island caters to you as well. True, hills are hard to come by in Hilton Head, but being an island we have a number of bridges. This route will take you over the Cross Island Bridge to ensure a good workout and is roughly 12.5 miles when it’s all said and done. Starting from the Sea Pines circle on the south end you can either head up Palmetto Bay Road or William Hilton Parkway to start the loop, the only real difference between the two is when the bridge will come into your workout. If you’d like to knock it out toward the beginning head down Palmetto Bay. If you want to tack it on to the end of a good ride, head down William Hilton Parkway. Whichever way you go, the first little bit will be the most crowded. As you head farther away from the south end traffic will thin and you’ll have open road to really open up. We’ll start down William Hilton Parkway. You’ll ride for about five miles until you reach the intersection with Matthews Drive. Take a left here then take your next left down Marshland Road. Marshland Road has a wide newly paved bike path that is rarely crowded, or you can stick to the road if you’d prefer. Four and a half miles down Marshland, you’ll meet up with the Cross Island Expressway. Take a left to cross over the bridge and head back toward the start. The Cross Island Bridge crosses over beautiful Broad Creek and provides stunning views along the way, with a pretty steep incline it is a decent challenge on the bike as well. As you decline the bridge you’ll speed onto Palmetto Bay Road and after about a mile and a half you’ll be at the start. If one time wasn’t enough go for round two, you’ll feel it the next day.